Whether it’s donating time for industry efforts or giving back to communities, ALTA members share a common bond of volunteering that mainly goes unnoticed. Read on for stories of "giving back" from ALTA members across the country. The title insurance industry experienced significant changes in 2010. From the introduction of the new GFE/HUD-1 which brought difficulties dealing with multiple interpretations of the rules by lenders and confusion from consumers to sweeping financial regulatory reform legislation that included the creation of the Consumer Financial Protection Bureau, which now has oversight over RESPA, ALTA has worked to represent the interests of the industry. Read on for a recap of various ALTA successes the past year, including a new high watermark for membership. During its 2010 Annual Convention in San Diego, ALTA donated 100 pounds of soap from staff rooms and participating attendees that stayed at the Manchester Grand Hyatt. The donation will help 99 children for one month. A motion to intervene by the United States was granted Dec. 22 by the U.S. Sixth Circuit Court of Appeals in a lawsuit accusing two real estate companies of setting up sham title companies in order to receive kickbacks. The underwriter's ratings originally had been placed under review with developing implications pending further evaluation of and potential impact to the ratings from the financial strength and support of its parent, Lender Processing Services. The Federal Reserve Board released a revision to a Truth in Lending Act rule attempting to clarify how lenders are required to disclose changes in interest payments for adjustable-rate mortgages. The title insurance company was ranked No. 20 on CareerBliss' 2011 list of "Happiest Companies in America," which compiled reviews from employees regarding growth opportunities, compensation, benefits, work-life balance, career advancement, senior management, job security and whether the employee would recommend the company to others. The deadline for obtaining unconditional direct endorsement mortgagee approval was extended to July 1, 2011, while FHA approval for loan correspondents was pushed back to March 31, 2011 for those who have loans in the pipeline that meet certain criteria. Several errors were discovered in the previous release of Candidate Recommendation V3.0 2010-05 after it was examined extensively by many organizations. Legislation supported by the Michigan Land Title Association that that increases the Michigan single-risk limit from 10 to 50 percent of surplus was signed into law by the state’s governor. The National Association of Insurance Commissioners made changes to chapter 18, which provides a suggested format for conducting title insurance company and title insurance agent examinations, and incorporated input provided by ALTA. The Wayne County Register of Deeds has created an online calculator in an attempt to help consumers shop title insurance rates. A revised timeline for appraisers and lenders to comply with the Uniform Loan Delivery Dataset was issued by Fannie Mae. Ted Faust will manage Stewart’s independent agency network in those markets. WFG Hires VP to Oversee Agency Operations in N.C.
Robert Bauchle has been named vice president and will oversee all agency operations in North Carolina for WFG National Title Insurance Co. The county’s commissioners voted unanimously to approve a contract with a vendor that will digitize all of the county’s records dating back to 1878. In its latest roundup, HUD disclusses disclosure of the New York sales and use tax on information services (such as abstracts of title and other public record searches) purchased by title companies on the GFE and HUD-1/1A; disclosure of services obtained in prior transactions on the GFE and HUD-1; and disclosure of verifications of employment or deposit charges on the GFE. Westcor Land Title Insurance Co. announced two additions to its legal department. Roger Therien was named southwest regional counsel, while Jim Kletke was named “of counsel” to the corporate team. The American Land Title Association submitted a letter Dec. 15 to the Financial Accounting Standards Board sharing concerns regarding proposed changes to the insurance contract accounting standards. Steven Winkler will be responsible for title insurance underwriting for all members of the Williston Financial Group family of companies, including WFG National Title and New Millennium Title Group. The former president and co-founder of one of the largest independently owned title companies in New York pled guilty in Manhattan federal court to defrauding clients by misappropriating and embezzling millions of dollars of escrow and other client funds, the U.S. attorney for the Southern District of New York announced. According to Orleans Parish Clerk of Courts Dale Atkins, about 60,000 conveyance documents will be restored by Jan. 2, and more than 119,000 mortgage records will be restored by mid-January. Stewart Title has opened a new regional production center in Nampa, Idaho, for enhanced title search services. The National Association of County Recorders, Election Officials and Clerks and the International Association of Clerks, Recorders, Election Officials and Treasurers announced their opposition to a proposed bill to study the creation of a federal land titling system and ban Freddie Mac, Fannie Mae and Ginnie Mae from accepting loans registered with the Mortgage Electronic Registrations System. The bill, which was signed by Gov. Chris Christie, was supported by the New Jersey Land Title Association. Independent mortgage banks and subsidiaries made an average profit of $1,423 on each loan they originated in the third quarter of 2010, up from $917 per loan in the second quarter of 2010, according to the Mortgage Bankers Association’s 3rd Quarter 2010 Mortgage Bankers Performance Report. The Federal Housing Administration extended condo project approvals with an expiration date of Dec. 7, 2010. Charles Cain will be responsible for developing and managing relationships with title agencies in 14 states across the Midwest. As servicers, lenders, and REO departments review their operation plans for 2011 and beyond in “attorney states,” they will need to disclose the risk of losing the right to foreclosure and other equitable remedies to their investors before choosing a non-attorney alternative in attorney states such as North Carolina and South Carolina. The D.C. Land Title Association supported the legislation and believes it will result in better prepared title professionals working in the region. John Voso, chair of ALTA’s Title Association Political Action Committee, reported TIPAC raised more than $250,000 for the second consecutive year. RamQuest Inc., a business solutions provider for the title and escrow industry and developer of the Closing Market digital network, was recently honored as a winner in the 2010 Celebration of Enterprise Awards. WFG National Title Insurance Co. has tabbed Adrienne Mann to lead national agency group, while also appointing Gael Uhlig as national agency counsel. Stephen Robertson replaces the late Carol Cutter as the state's insurance commissioner. ALTA opposes a bill introduced by Rep. Marcy Kaptur (D-Ohio) that could lead to the creation of a federal land titling system and ban Freddie Mac, Fannie Mae and Ginnie Mae from accepting loans registered with the Mortgage Electronic Registrations System. Lenders and settlement service providers who have partnered with technology partners with the bandwidth to process Good Faith Estimates in all 50 states with speed and accuracy, have been able to compete at the national and local level while providing the best value to their customers. The Texas Land Title Association and several other industry parties filed a motion for rehearing in response to the insurance commissioner’s determination that rates would remain unchanged. Industry veteran Lloyd Draper was named senior vice president, Agency Division for the states of Texas, New Mexico and Oklahoma for WFG National Title Insurance Company, which has formed an affiliation with long-time title attorney Bert Massey of Massey & West to provide greater resources for its Texas agencies. According to ALTA’s preliminary 2010 Third-quarter Market Share Analysis, the title insurance industry generated $2.48 billion in title insurance premiums during the third quarter of 2010, down 1.9 percent from the third quarter of 2009. In a letter to the Hidalgo County Clerk’s Office, Texas’ assistant attorney general said county officials must transfer bulk records to the USB hard drive of those requesting the records. Read on to learn what sparked this debate and what the Texas assistant attorney general concluded. Christopher Condie, president of The Land Title Association of Colorado, said Marcy Morrison was instrumental in establishing the Title Advisory Council, a group of 13 members of the title insurance industry in Colorado that meets quarterly with the Division of Insurance. WFG National Title Insurance Company named Gene Redabow as its state agency manager, while hiring six other industry veterans focused on growing the company’s title agency relationships in Florida. The Orleans Parish in New Orleans has 58 people helping to recovery mortgage and conveyance records that were lost due to a computer crash, according to Clerk of Court Dale N. Atkins. Among the topics to be discussed will be the legislative and regulatory landscape, economic outlook for 2011, implementation of MISMO's V3.0 reference model and legislative and eBusiness updates. ALTA’s Abstracter & Agent Research Committee has developed a survey aimed at capturing information that explains the curative efforts performed by the title insurance industry. Read on for information on how to participate in the survey. Fitch's title sector director said beyond the magnitude of the economic recession and property market downturn, the issues currently plaguing the title insurance industry are similar to those of past cyclical downturns. HUD introduced a revised HUD-1 Settlement Statement that imposes penalties for false certifications or fraudulent activities and new language for sellers of a HECM for purchase transaction. The new certification language must be used for all HECM case numbers assigned on or after Dec. 1, 2010. Read on to learn how this impacts settlement agents. ALTA’s Title Counsel Committee advises that this case reinforces the consideration of a requirement for a waiver of sovereign immunity when insuring a grantee or mortgagee of such entities. Read on to learn why it’s also important to confirm that the authorized entity or officers have signed the documents and that there has been procedural compliance with tribal law for approval of the transaction. The U.S. Department of Housing and Urban Development responded to questions and comments related to its interpretive rule on the payment of fees to real estate brokers and agents by home warranty companies. Kenneth Phillips will be responsible for business development including growing and maintaining client relations, as well as expanding the organization’s sales force and coordinating efforts of the Fidelity family of title companies. William Moody will direct Simi Valley-Calif.-based New Millennium Title, the lender services division for Williston Financial Group. Fannie Mae’s chief economist said the expiration of the home-buyer tax credit played a role in the third-quarter decline of home sales. Real estate transactions continue to be delayed in the Orleans Parish due to a computer crash nearly a month ago that resulted in the loss of mortgage and conveyance records. The Federal Deposit Insurance Corp. reported that state and federal regulators closed banks in Wisconsin, Florida and Pennsylvania. ALTA President Anne Anastasi testified Thursday during a Congressional hearing titled “Robo-Signing, Chain of Title, Loss Mitigation and Other Issues in Mortgage Servicing” before the House Subcommittee on Housing and Community Opportunity. Read on to view some of her comments. Texas’ high court rejected the state’s claim that beach easements “roll” with the vegetation line and may not allow the state to ask landowners to remove private property if a hurricane or other natural disaster moves it within the public section of a beach. In the midst of the foreclosure-gate and robo-signing controversy, the details of certain business processes in the real estate industry have suddenly come under intense scrutiny. Read on from advice from Mandrien Consulting Group's eGuide titled “The Three Things Killing Your Title Insurance Company,” which outlines some practices that may have contributed to the foreclosure crisis. The Michigan Office of Financial Insurance Regulation recently revoked the licenses of two title insurance agencies and their owners. Read on to learn why. The integration allows TSS customers to send an order from TitleExpress directly to TitlePrep for processing. The new offering enables users to create Good Faith Estimates with real-time fees backed by a compliance guarantee. Advantage Title, a provider of title insurance and escrow services powered by Title365, expanded to the East Coast with the opening of its new office in Maitland, Fla., which will be managed by Scott Ludwig. Jim Czapiga was named vice president, Connecticut and Rhode Island agency services manager for Stewart Title Guaranty Co.
ALTA has partnered with InterCall to provide discounts to audio and web conferences. Find out how you can take advantage of this member benefit. Freddie Mac reported the trend toward shorter loan terms continued during the third quarter of 2010. A part owner of a Florida-based title company has been charged in a mortgage scheme resulting in the approval and disbursement of more than $500,000 in mortgage loans. The title insurance industry came to the rescue to help recover lost electronic mortgage and conveyance documents files when the Orleans Parish Civil District Court records system went down last month. Read on to see how the industry worked with the clerk of courts to resolve the problem. ALTA has created the Office Security and Privacy Guidelines to provide guidance to offices about protecting sensitive customer and company information. The three videos posted on HUD’s website and on YouTube provide information on shopping for a home, shopping for a loan and closing the deal. The state’s insurance commissioner rejected recommendations by the Texas Land Title Association, the State Office of Administrative Hearings judges and other industry parties to increase rates. A Florida appellate court reversed a lower court decision granting a lender’s motion for summary judgment of foreclosure, ruling the lender had not proved it had standing to foreclose. The new options within TitleExpress include a HUD-1 solution, a title documents solution, a complete title and closing solution and a fully integrated title and closing solution. ALTA's 2011 Federal Conference and Lobby Day, which is being held March 13-16 at the Liaison Hotel on Capitol Hill in Washington, D.C., is the best way for title professionals to meet with Congressional leaders to discuss the importance of the industry and to share how federal decisions impact the future of your business. Photos from ALTA’s 2010 Annual Convention, which was held Oct. 13-16 in San Diego are now available and may be viewed here. Online proceedings are also exclusively available to attendees and will be available to all members at the end of January. Corinthian Title Insurance Co. announced that Ronald Maudsley has joined the company as president and will be responsible for leading the company's growth into new regional markets. The majority of respondents to Ernst Publishing's survey indicate fees have increased 5 percent or less over past 12 months. Read on for more results. The foreclosure issue brought on by lenders' faulty paperwork processes has given ALTA several opportunities to share the importance of title insurance. ALTA CEO Kurt Pfotenhauer recently participated on the Norris Group Real Estate Radio Show discussing the industry's value proposition and then provided an update on the foreclosure issue and how the industry will be impacted. The ALTA-approved version has been re-formatted for easier reading and reflects several technical and grammatical corrections since the draft was first posted in August. Attorneys Title Agency now hase 25 offices and 450 employees throughout Michigan with the acquisition of Philip F. Greco Title Co. Find out how the combined company will be branded. Agents National Title Insurance Co. added Wyoming to the list of states it is licensed to operate, while announcing it named Pierce Curran as its Arkansas agency manager and added Brian Blackman to its underwriting staff. The American Land Title Association announced the addition of Kelley Williams as manager of government affairs and Steve Gottheim as legislative and regulatory counsel. Manhattan-based TitleVest said the service offers a centralized source for obtaining and viewing coop and condo offering plans. Alaska, Arkansas, North Dakota, Oregon and New Mexico led all states with the largest percent increase of loans closed between August and September. The American Land Title Association wrote the U.S. Department of Treasury and the Consumer Financial Protection Bureau to consider several recommendations to improve mortgage disclosure forms and make them easier for consumers to understand. The goal of the program is to increase Habitat for Humanity volunteerism, among MLTA’s membership base, by presenting MLTA members with multiple and varied volunteer service options. North Carolina-based Investors Title Co. reported its net income increased 49.5 percent to $1.5 million during the third quarter of 2010, compared to $969,043 for the prior year period. Results from Tuesday’s elections across the country will result in changes for several state insurance commissioner positions. Read on for a roundup of state results. If your client or customer asks you to input data into its database, do you readily agree, or do you first ask if you have the right to do the inputting? Read on to learn the rules. When several lenders halted foreclosures and the sale of real estate owned (REO) properties due to possible flaws in documentation used in the foreclosure process, questions were raised about the validity of title to properties that had been foreclosed and resold. ALTA worked immediately with regulators and lenders to bring certainty back to a chaotic situation. Read on to get information on ALTA’s response, FHFA guidance and indemnification. ALTA has also provided a comparison of the foreclosure process in judicial and non-judicial states, timeline involving the judicial foreclosure process and information about right of redemption after a foreclosure sale. Results from today’s elections across the country could result in changes for several state insurance commissioner positions, including California, Georgia and Oklahoma where voters will select the next commissioner. Read on to see what's going on in several other states. The National Association of Insurance Commissioners’ Title Insurance Task Force set several goals during its meeting last month, such as modernizing solvency regulation; combating mortgage fraud and mitigating title agent defalcations; analyzing the feasibility of promoting effective consumer shopping for title insurance; and developing implementation strategies to assist states in collecting data related to the Title Insurance Agent Statistical Report. ALTA announced that veteran land title insurance industry professional Anne L. Anastasi has been named president for the 2010-2011 year. First American Financial reported its title insurance and services division recorded an income of $60 million during the third quarter of 2010, compared to income of $70 million during the same period a year ago. Old Republic International reported its title insurance segment posted a profit of $5.7 million during the third quarter of 2010, up from $4 million during the same period a year ago. The Financial Crimes Enforcement Network released its 2009 Mortgage Loan Fraud study which found the number of mortgage fraud suspicious activity reports filed in 2009 grew 4 percent compared to 2008. The Mortgage Bankers Associations expects total mortgage originations to fall from an estimated $1.4 trillion in 2010 to slightly under $1 trillion in 2011. With passage of health care reform, and a major overhaul to financial legislation and the creation of the Consumer Financial Protection Bureau, the 2010 elections are shaping up as a referendum on the question of how much government is too much government. Read on as two ALTA members each offer a different perspective on the proper role and scope of regulation. Yes, if it’s smart and well thought out as sound policy matters. To oppose regulation because all government involvement in private enterprise is bad, is to not enter the conversation. It’s a conversation we must have and that we as title people must take part in. Why less government, not more, is crucial. Economic freedom and earned prosperity are corollaries. Our industry, like our country, fundamentally derives from economic freedom. It is what we need now, and what we must fight for going forward, if success is our goal. Although a disruption in the foreclosure process by lenders could negatively impact earnings in the short term, Stewart reported third quarter title revenues were not impacted by the temporary suspension of foreclosures announced by certain lenders. The new mobile communication tool enables on-the-go access to real estate closing transaction information. Iowa Insurance Commissioner Susan E. Voss was elected as president, while the NAIC named Florida Insurance Commissioner Kevin M. McCarty president-elect. The new center expands capacity to support growing roster of customers and enhances loss mitigation and short-sale services. The additions include 21 new environmental and safety inspection categories for Block 6 of the new GFE form, while another new feature enables users to auto-select Fannie Mae required title endorsements, and search for open files by GFE file ID, loan number or property address. A ruling by the Pennsylvania Supreme Court’s in White v. Conestoga may have implications for future class action litigation against industry participants, as well as future pricing practices. Read on for details. The American Land Title Association continues to monitor legislation and regulation impacting access to public records. Read on for an update provided by ALTA’s Real Property Records Committee to find out what’s going on in Arkansas, California, Illinois, Minnesota, Missouri, New Jersey, Ohio and Pennsylvania. Legislation supported by the Pennsylvania Land Title Association to prohibit the future use of private transfer fees in Pennsylvania recently passed the Senate and is now under consideration in the House of Representatives. ALTA interviewed five members during the Annual Convention, asking them how they got involved in the industry, why they love being a title professional and the importance of being an ALTA member. Title operating results rebounded in 2009 following the freefall in the real estate market in 2008, when title insurance revenues — dependent on housing demand and price levels — fell sharply compared to prior years, and most of the major title insurance underwriters had posted net losses, according to A.M. Best. The program is designed to make it easier for Houston-based title companies to compete in the Dallas/Ft. Worth title insurance market, and for Dallas/Ft. Worth-based title companies to compete in the Houston market. Illinois-based Attorneys’ Title Guaranty Fund recently appointed veteran employee Michael Moore as the new president of NLT Title. Fidelity National Title Group’s chief underwriting counsel issued a bulletin informing its agents of company guidelines regarding foreclosed properties. The purpose of the ALTA is to to promote the safe and efficient transfer of ownership of, and interest in, real property within the free enterprise system; to provide information and education to consumers; to those who regulate, supervise, or enact legislation affecting the land title industry; to its members; and to affiliated state, district, territorial, provincial, regional, and international associations; to maintain liaison with users of the products and services provided by its members and with government; to maintain professional standards and ethics; and to provide assistance to affiliated associations. Taking the stage to “Eye of the Tiger,” outgoing ALTA President Mark Winter provided attendees of the 2010 Annual Convention assurance that ALTA has devised a a master plan that will position the association for greater strength once the recession ends. Fidelity National Title Group earned $135.5 million during the third quarter of 2010, up from $119.8 million during the same period a year ago. Two long-time industry veterans were honored with honorary memberships to the American Land Title Association during the 2010 Annual Convention in San Diego. Read on to see which members received this high award. Fidelity National Financial, the parent of Fidelity National Title Group, reported its chief executive offer stepped down and was replaced by the company's chief operating officer. ecurities Industry and Financial Markets Association rejects sweeping claims that fundamental flaws regarding the transfer and ownership of mortgage loans are endemic to secondary markets and mortgage securitization. Appraiser Independence Requirements are replacing the Home Valuation Code of Conduct at government-sponsored enterprises Fannie Mae and Freddie Mac, the Federal Reserve announced. The American Land Title Association strongly supports proposed guidance from the Federal Housing Finance Agency to prevent government-sponsored enterprises Fannie Mae, Freddie Mac and the Federal Home Loan Bank from investing in mortgages encumbered by private transfer fee covenants. On Sept. 27, 2010, President Obama signed into law the Small Business Jobs Act, which will provide resources to help small businesses continue to drive economic recovery and create jobs. Read on for a summary of the law provided by the Small Business Administration. Partnership between title rate engine provider and mortgage technology software company will provide a transparent lending process for borrowers while allowing lenders the opportunity to remain compliant. Moderated by Kurt Pfotenhauer, chief executive officer of ALTA, top executives from the national underwriters discussed several issues impacting the title industry, including the foreclosure documentation crisis; when the economy with begin to recover; RESPA implementation; impact of new Consumer Financial Protection Bureau; improving searching and underwriting standards; and the latest in claims trends. Participating on the panel were Chris Abbinante, Fidelity National Title Group; Dennis J. Gilmore, CEO, First American Title Insurance Company; Malcolm S. Morris, chairman & CEO, Stewart Title Guaranty Company; Rande K. Yeager, chairman & CEO, Old Republic National Title Insurance Company. Click here to listen to a segment of the conversation as Pfotenhauer and Morris discuss pressures on pricing. Carlson offered a humor-filled and unfiltered view of the Obama Administration and how the current economic conditions will impact the voters. Click here to hear some of Tucker’s comments including his thoughts on the 2012 election, who will emerge as the Republican candidate and why support for President Obama has taken a severe hit. Now you can get all the information you need to know about the Annual Convention, including schedules, list of exhibitors, attendees, maps and more, all on your phone: Click here to download the app. Stay tuned to TitleNews Online as we provide more in-depth coverage of the Annual Convention. ALTA submitted a comment letter Oct. 15 applauding the Federal Housing Finance Agency for its guidance to the Fannie Mae and Freddie Mac on the growing use of private transfer fee covenants and their negative effect on consumers, the enterprises and Federal Home Loan Bank. Mike Armstrong has joined the Data Trace Information Services as vice president of sales. PRIA says a Uniform Document Numbering System will provide a mechanism to easily recognize the specific jurisdiction in which a document is recorded, allow for an historical update to make document numbers consistent in pattern or style and offer land records software system vendors a platform to provide consistent services nationwide. Opening her presentation, Theresa Payne thanked ALTA and the title insurance industry for taking the lead in implementing the new RESPA Rule. She acknowledged the hard work and monetary investment the industry made in order to adapt to the new regulation. On the investigation front, Payne explained that HUD opened more than 2,000 cases and is committed to increase enforcement in the coming year, adding the department is looking at many different cases involving sham AfBA relationships. Click here to listen to some highlights from Payne's presentation. Giving a presentation titled "Unusually Uncertain Times," Doug Duncan offered his thoughts on several issues impacting the economic recovery. He touched on the United States' labor movement and a shift in jobs from manufacturing to service-based employment; discussed household consumption and confidence; housing supply; and the uncertainties new policies have on recovery. He concluded his presentation giving details about Fannie Mae's National Housing Survey. Click here to listen to Duncan share results from the survey. Stay tuned to TitleNews Online as be provide more in-depth coverage of the Annual Convention. The new product provides users with the ability to order automated title products directly from Data Trace’s website, eDataTrace.com, or through an integrated Web service directly connected to the user’s own production system. Integrity Title now offers statewide access in 26 counties, representing the 9 major metropolitan markets of Amarillo, Austin, Beaumont, Corpus Christi, Dallas/ Fort Worth, El Paso, Houston, San Antonio, and East Texas. The company will release and discuss earnings results for the third quarter of 2010 on Oct. 28. Friday's general session will feature Fox News Senior Political Analyst Tucker Carlson, who will offer an unfiltered view of the Obama Administration and Capitol Hill, while executives of the national underwriters discuss the future of the industry. Get a preview of Friday's sessions and activities. ALTA supports the Federal Housing Finance Agency’s four-point policy framework for resolving potential foreclosure process deficiencies. The exemption is limited to subordinate loans that provide assistance for low- and moderate-income persons. Read on. This year’s ALTA Annual Convention in San Diego will provide insider insight into the current and future state of the housing and mortgage markets, while providing educational opportunities and business strategies needed to compete in the uncertain market in 2011 and beyond. ALTA believes these questionable foreclosures will ultimately have little adverse impact on the new owners of REO properties or on the title insurance claims. Stewart Global Solutions announced the promotion of Jill Urban-Karr to executive vice president. Urban-Karr handles market development activities in Africa, the Middle East, the Caucuses and Eastern Europe. Linear Title & Closing reports that successful implementation of TitleHound, a title rate engine that ensures accuracy of title insurance premiums, has led to an increase in business. Americans need assurance the economy will rebound, yet the article “After Foreclosure, a Focus on Title Insurance,” simply incited fear by speculating that homeowners who purchase foreclosed properties will lose their homes. On the heels of completing final approvals of loans to nearly 2,000 firms that has been in its loan queue waiting for final approval of the Small Business Jobs Act, the U.S. Small Business Administration has finished implementation of another major element of the bill: increasing maximum sizes in several of its loan programs. Canada-based LAWPRO reported it has made changes and appointments to its claims management group. Title insurance industry professionals provide a great service to the economic growth of the country. Many times, however, they don’t speak up about their important role in the transfer of real estate. Read on to learn about the “I Am a Title Professional” speech that can help educate others in what you do daily to make sure people have clear rights to homeownership. To highlight the importance of standardized policy forms, ALTA will periodically provide some commentary regarding the evolution of ifs forms since the adoption of its first owner’s policy in 1959. Read on to see how the forms evolved during the 1980s. Missouri-based Agents National Title Insurance Company (ANTIC) is now licensed to operate in six states. Fidelity National Financial Inc. will release third quarter earnings after the close of regular market trading on Oct. 20. A conference call will follow at 9 a.m. on Oct. 21. ET Investments has expanded its footprint in Colorado with the purchase of the Title Company of the Rockies from TM Holdings. New Federal Housing Administration (FHA) insurance fees for mortgage insurance went into effect Oct. 4 that result in lower closing costs for borrowers, while increasing the annual premium. Read on to see how this could stir new activity in the market. The American Land Title Association, which is working closely with Fannie Mae, Freddie Mac and federal banking regulators to keep the REO market fluid, is discussing what steps lenders might take in order to ensure that title insurance policies can continue to be issued on REO properties. With short sales continuing to comprise a significant portion of the real estate market, it is important title agents review the many pitfalls associated with this type of transaction. The workgroup will collaborate with other GIS interest groups to establish standards, procedures and best practices for data exchange between GIS and land records systems to facilitate the sharing of information and improve performance, security and revenue opportunities. With the industry having tackled RESPA reform implementation, the next wave of compliance reform will center on the NAIC Data Call and the harmonization of the GFE/TILA/HUD-1 forms, as well as other changes brought on by the Dodd-Frank bill. Get advice from RamQuest to learn how a proactive approach to regulatory changes can help your operation develop a recipe for long-term business success. Two more banks were closed Friday as the Federal Deposit Insurance Corporation (FDIC) took receivership of Shoreline Bank in Shoreline, Wash., and Wakulla Bank, Crawfordville, Fla.
With the recent passage of sweeping financial legislation and the creation of the Consumer Financial Protection Bureau, ALTA wanted to gauge where membership stood on the issue of allowing markets to operate freely or the need for government intervention. Check out the results. The American Land Title Association applauds U.S. Rep. Maxine Waters and co-sponsors Gwen Moore, Brad Sherman and Albio Sires for introducing a bill that protects consumers from a harmful real estate scheme that strips homeowners of equity in their house and depresses home prices. ALTA supports efforts to incentivize energy efficiency retrofits in residential and commercial buildings; however, the association urges careful review to ensure that any such proposals do not alter traditional lien priorities. Read on for more on ALTA's letter to leaders of the Senate Energy and Natural Resources Committee. Riverside and Santa Barbara counties have received state Attorney General clearance to begin recording property documents electronically through a multi-county recording system pioneered by Orange County. The partnership aims to help promote home ownership and to provide information to distressed home owners on alternatives to avoid foreclosure. Looking for a night filled with appreciation for courage, freedom and service to the United States? Then you won’t want to miss ALTA’s closing reception and banquet for our 2010 Annual Convention aboard the USS Midway. Do you need to know details on state laws relating to the licensing and operating requirements of title insurers, title agents, abstracters, and escrow and closing agents? The Title Insurance Regulatory Survey should be your go-to source of information. With the improvement of disclosures for mortgages and other financial products a top priority for the new Consumer Financial Protection Bureau (CFPB), Treasury Secretary Tim Geithner and Elizabeth Warren, assistant to the President and Special Advisor to the Treasury Secretary, unveiled a draft of a new combined RESPA/TILA/GFE form during a roundtable discussion of simplifying mortgage disclosures. With the National Flood Insurance Program set to expire for the fifth time this year Sept. 30, ALTA joined other insurance trades in pressuring Congress for an extension of the program that provides cost effective flood insurance for homeowners in special flood zones. James Bennett was named division president for Stewart Title in Nevada, while John Gilbert will head up the D.C. office, which will serve D.C., Maryland and Virginia. HUD released the second volume of the RESPA Roundup providing information about pertinent VA circulars, the disclosure of payments to subordinate lien holders on the HUD-1, and a call for suggested topics for future RESPA Roundups. Final numbers are now in for ALTA's second-quarter Market Share Analysis. One of the fastest growing areas of employment litigation relates to employee claims of back wages and overtime for misclassified employees. This presentation will teach you the latest in labor law so you can protect your company from how to protect your company from potential disastrous damages. With regulators and law enforcement focusing more on mortgage fraud, It's imperative to protect your operation. That’s why ALTA has provided three professional development sessions at the 2010 Annual Convention aimed at helping title insurance professionals learn the latest fraud trends, how to spot the fraud and how to prevent the fraud. This information will help differentiate your company from the competition and will prove to your clients you operate at a higher standard. Do Your Lender Clients Know the Rules to Using Social Media? While there are reports that more and more businesses are using social media websites to promote their business, mortgage lending companies must be aware that social media is widely considered a form of advertising, triggering various state and federal disclosure requirements. Read on for helpful advice you can share with your lending customers. Husband and wife pairs in Maryland and Virginia each took turns as president of their state land title associations. Read on to learn how the couples juggled their leadership responsibilities. A call center targets Spanish-speaking borrowers for full-service loss mitigation. The title software company announced a web feature that allows clients and third-party vendors to communicate and increase efficiency. With the title agent data call approved and finalized, the NAIC Title Insurance Statistical Plan Working Group moved onto the implementation phase. The Secretary of the Treasury designated July 21, 2011, as the date for the transfer of functions, including oversight of RESPA and TILA, to the Consumer Financial Protection Bureau. The American Land Title Association joined 12 other associations in a letter to the Senate Committee on Banking, Housing & Urban Affairs urging support for covered bond legislation in order to provide an additional source of liquidity to help raise much needed capital to fund commercial real estate loans. The company said its national services group will provide a single point of contact and local closings for purchasers of multiple-property portfolios. Excel Title Group, which is licensed in 15 counties in Texas, has purchased Southlake, Texas-based Ameristar Title Co.
Barry Smith will serve as vice president and associate senior underwriter in the company’s Houston office. Implementing a change process can be difficult for title companies. Read on to learn about a six-step process that identifies what leaders can do to make their change efforts successful. The ALTA will provide testimony and also encourages members to testify or submit comments to the NAIC about the dangers of private transfer fee covenants. The bill would prohibit certain private transfer fees once enacted and also impose disclosure and recording requirements on existing private transfer fee obligations made as part of the sale of real property. Kurt Pfotenhauer will participate Oct. 4 on the weekly 60-minute radio program Lykken on Lending & Housing. Thirty-five-year industry veteran Joe Drum will head up the Santa Barbara, Calif.-based agency services division for WFG National Title Insurance Co., which is licensed in 33 states. The company also finalized its integration with SECURE, a California multi-county electronic recording delivery system. ALTA's 2009 Annual Convention, being held Oct. 13-16 in San Diego is less than a month away. Your chance to take advantage of discounted pricing ends this week, so register by Sept. 17. Check out which states experienced the largest increase in loans closed from July to August, according to eLynx. Data was compiled from settlement agent activity on the eLynx network, which has processed more than 45 million loans. The new division will provides title, settlement and valuation solutions for residential originators. Of all the hidden costs now being discovered in the health care bill, one of the most concerning is Section 9006, which would place an unprecedented burden on small business reporting and paper work requirements. Read on to learn how this could impact title and settlement operations as an amendment to repeal this provision was rejected in the Senate. Get an update on all of the meetings ALTA has planned for the remainder of 2010. Real estate sales are down to historic lows and many title insurance agencies have gone through waves of employee layoffs. Nonetheless, in order to stay in business, owners have been forced to keep up with new technology and new business rules at the same time competing with other companies and the underwriters. Like it or not, business practices and the business environment are changing and title companies will either change or die. In part one of this two-part series learn why people, including title agents, often reject change, while next week’s second part will discuss a six-step process that identifies what leaders can do to make their change efforts successful. In an effort to enhance communications with industry stakeholders and consumers, HUD will send its RESPA Roundups directly to you. If House Bill 6402 passes, Michigan would become the 19th state to restrict the use of private transfer fees. Joseph W. McNamara Jr., a former board member of the American Land Title Association and past president of the Nebraska Land Title Association, passed away Sept. 2 at the age of 79. CATIC received responses from nearly 1,800 attorneys and paralegals from six New England states on how the new RESPA regulations have impacted their operations. Read on to find out how respondents prepared for the new rule, how the rules were implemented and the impact on consumers. Nominations for the ALTA Board of Governors, as well as the Abstracters and Title Insurance Agents Executive Committee and the Title Insurance Underwriters Executive Committee will be voted on during the 2010 Annual Convention, being held Oct. 13-16 in San Diego. The Florida Land Title Association has submitted new language and is currently working with the Florida Department of Financial Services to create a new revision with the language proposed by the FLTA. If you register for ALTA’s Annual Convention by Sept. 13, you will be entered for a chance to win two tickets for a tour of San Diego ($140 value). First American Title Insurance Co. announced that its AgentFirst mobile application for Android and BlackBerry smartphones is now available for free download. The company is now signing title plant subscription agreements for Collin, Denton and Tarrant counties in Texas, and will soon add Dallas County. The proposed 2011 standards are the result of a two-year effort by ALTA and National Society of Professional Surveyors, and resulted in the first major rewrite since they were first adopted in 1962. The Federal Housing Finance Agency has sent a final rule to the Federal Register establishing new housing goals in 2010 and 2011 targeting segments of the mortgage market for Fannie Mae and Freddie Mac. If you plan on attending ALTA’s 2010 Annual Convention, being held Oct. 13-16 at the Manchester Grand Hyatt in San Diego, don’t forget to register by Sept. 17 to save $200. The company said the Commerce Velocity technology will be aligned with ServiceLink, the national lender platform for FNF, to create a complete workflow management solution from loan origination through loss mitigation, default and asset disposition. A title company was sued for allegedly disbursing funds without disclosing a payment after escrow was closed and the deeds were recorded. Read on for analysis of the lawsuit and why escrow agents should be aware of potential liability for breach of closing instructions after escrow technically closes. Ann Frohman will step down from the post she has held for nearly three years to pursue other opportunities in the private sector. The American Land Title Association provided comments to the U.S. Department of Housing and Urban Development’s Advanced Notice of Proposed Rulemaking regarding potential revision or clarification of its “required use” provision. The Ohio Supreme Court reversed the Eighth Appellate District Court and a trial court holding of a lender’s attempt to obtain priority via the doctrine of equitable subrogation. The American Land Title Association reported title insurance premiums written during the second quarter of 2010 decreased 8.5 percent when compared to the same period a year ago. The company’s eHUD service automatically compares fees on the HUD-1 to the original GFE, identifying differences that exceed the allowable amount and improving compliance. If you register for ALTA's Annual Convention by Sept. 6, you will be entered for a chance to win a free night's stay (a value of $279) at the Manchester Grand Hyatt during the convention. The software development company will provide title agents a financial vehicle to cover a considerable portion of technology migration costs, often exceeding $5,000 per installation. The American Land Title Association will hold its 2011 Federal Conference and Lobby Day from March 13-16 at the Liaison Hotel on Capitol Hill in Washington, D.C.
First American Financial Corp. announced the appointments of Max Valdes as chief financial officer and Mark Seaton as senior vice president, finance. This is the company's first year being recognized by the prestigious Inc. 500 list with an overall ranking of No. 283. Is Equitable Subrogation Dead for Lenders in Missouri? Lender’s equitable subrogation is a tool by which real property lenders, or lienors, may replace the prior, senior lien position of an earlier in time lender by paying off that prior lender’s loan. Read on to learn how the use of this doctrine has been limited over the years by Missouri courts. According to the settlement, Corinthian Title allegedly failed to file escrow rates between October 2008 and November 2009 despite the fact it solicited and provided escrow services during that time. ALTA still has some outstanding issues it would like to see resolved surrounding policy counts, Full-Time Equivalent (FTE) employment information, confidentiality, implementation and calculating title agents’ value. For the second time this summer, HUD has provided a revised version of its Settlement Cost Booklet. The Title Insurance Workgroup within MISMO will meet Sept. 28 to discuss the eRemittance standard draft as well as ongoing work on the eHUD and Version 3.1 updates. Read on to learn how web-based software and the SaaS pricing model can increase efficiency for title agents. Westcor has now expanded its footprint into four new states in the past 12 months. The software provider’s latest version of its Complete Closing Enterprise features an addendum to the 2010 HUD-1 that allows for many different scenarios whenever additional itemization is needed. Jim Gosdin was appointed as chair of the Title Insurance and Surveys Committee of the Commercial Real Estate Transactions Group, while Bruce Hawley has been selected as chair of the Multi-Family Residential Committee of the Residential Multi-Family and Special Use Group. Beginning Sept. 1, Fannie Mae will prohibit servicers from directly or indirectly requiring or encouraging attorneys or trustees to use specified vendors in connection with Fannie Mae referrals, including title companies. ServiceLink reports that the timeline from contract approval to closing has been reduced to less than 45 days, providing for a total short sale completion time of less than 75 days. The title production software provider said the integration between its Closing Market and eRecording Partners Network will improve quality of data, quicker turnaround times and reduce costs for title companies. A 30-day comment period is open to comment on Board approval to revise two existing forms and create a Residential Shared Appreciation Mortgage Endorsement. Read on for more details. The Department of Veterans Affairs clarified language in a circular it issued July 30 that created confusion whether itemization of fees should occur on the HUD-1. As the company's director of customer support, Kathy Kling will utilize her depth of experience in the title industry to play a vital role in helping ResWare customers enable efficient paperless process flow and tracking. The American Land Title Association earned a significant victory as the Federal Housing Finance Board proposed to ban loans by Fannie Mae, Freddie Mac and the Federal Home Loan Banks on property encumbered by private transfer fee covenants. ALTA is proud to announce that Richard Bitner, author of "Confessions of a Sub-Prime Lender: Tales of Greed, Fraud, & Ignorance, and Tucker Carlson, Fox News senior political analyst, have been added to the impressive lineup of general session speakers scheduled for the 2010 ALTA Annual Convention, which is being held Oct. 13-16 at the Manchester Grand Hyatt in San Diego. 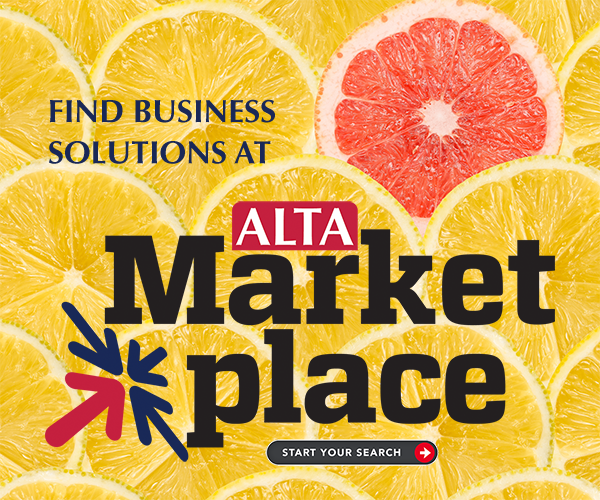 ALTA members can easily access the membership directory from their desktop by downloading the digital directory icon. The risk that Congress would retroactively change the estate tax rate will create a “hidden” lien on the title of any property of a decedent who died on or after Jan. 1, 2010. Stewart Title Guaranty is not liable for money a now disbarred attorney stole from his clients because the misappropriation of funds took place before the attorney acted as the underwriter’s agent, the New Jersey Supreme Court ruled in overturning a lower court’s decision. After state association leadership expressed the need for enhanced collaboration, two steering committees were formed in an effort to cultivate positive relationships between ALTA and state land title associations, while fostering enhanced partnerships between state associations. Whether you are coming for the first-class education opportunity to gather business strategies and earn CE credits, to network and develop new partnerships, or to simply enjoy the sights and sounds of San Diego, you will want to check out the 2010 ALTA Annual Convention registration brochure. The lender will submit lien releases electronically into Ingeo's nationwide network of e-recording counties. To be able to differentiate your company in the eye and mind of your customers is essential to gain market share and profitability. Whether your company is large or small, strong leadership is required to achieve this. Read on for advice on what it takes to move to the next level and achieve what others can not. Nevada and Idaho experience the largest increase in loan closings, according to the data. The Department of Veterans Affairs has announced new disclosure requirements regarding closings costs on the new HUD-1 settlement statement, effective for loan applications taken on or after Oct. 1, 2010. Second quarter 2010 commercial and multifamily mortgage loan originations were one percent higher than during the same period last year and 35 percent higher than during the first quarter, according to the Mortgage Bankers Association’s (MBA) Quarterly Survey of Commercial/Multifamily Mortgage Bankers Originations. ALTA members and staff devoted countless hours of time to provide input to the group and find ways to explain the value of the title search, exam and curative work. As a regional firm, Western Resources Title could not match the marketing budgets of larger competitors. The company opted to provide accurate, up-to-date real estate information, to maintain its existing client base and attract new prospects. Reporting earnings for the first time since splitting into separate companies, First American Financial’s (FAF) title insurance and services segment reported pretax income of $62 million. Investors Title Co. announced net income increased 20 percent during the second quarter of 2010 due to decrease in its provision for claims. St. Petersburg, Fla.-based Title Consulting Services Inc. has completed the necessary filings to become a publicly traded company. Jeff Bosse, a 35-year title insurance industry veteran, is the current president of the Indiana Land Title Association. Read on to learn about Bosse and a few issues impacting the state. A virus infected either the bank’s or the title agent’s computer system and enabled the theft of $200,000 from an escrow account. Read on for advice on how to protect your computer system. ALTA also has partnered with several associations to form a broad coalition asking the federal government to ban Wall Street Home Resale Fees, also known as private transfer fees. Have You Encountered a Private Transfer Fee in Your Market? To aid the push to ban private transfer fees, ALTA would like to know of specific instances where these fees have been attached to properties. Improvements to its direct operations, reduced operating costs and monetization of internally developed software helped Stewart Information Services post earnings of $18 million during the second quarter of 2010. The provider of real property solutions said it will be operational in eight counties in Utah and has hired Jim Johnson as its state manager. Professional development sessions at the 2010 Annual Convention in San Diego are packed with advice to help you grow market share and manage your operation. The treatment of Closing Protection Letters/Insured Closing Letters vary widely among the states that allow it. Read on for guidance on how to disclose this fee. The new regulations establish standards and information required for rate filings, requires title agents to report data to insurers and establishes a date by which this information must be submitted. Read on for more details. A Canadian law firm has issued a fraud alert that counterfeit checks bearing their name are being used in an attempt to purchase properties. While the American Land Title Association supports efforts to reduce energy consumption and limit greenhouse gas emissions, several questions need answered regarding the Property Assessed Clean Energy program in order to prevent potential risks in delaying or canceling real estate transactions. The software provider now offers a 100 percent Web-based solution with complete GFE and HUD-1 preparation. Closing.com’s national television commercial, which aired on cable networks last summer to announce the launch of Closing.com, has received a Telly Award. The president of the Indiana Land Title Association said this decision represents unfamiliar territory for Indiana title agents and the industry won’t really know the impact for some time. While Regulation Z currently requires the establishment of an escrow account for taxes and insurance for certain “riskier” first-lien loans, the Mortgage Reform Act extends this requirement to a broader range of loans. The two-page document addresses limited shopping lists, how to state loan terms and how to handle charges included on the GFE that the consumer does not purchase, such as owner’s title. Minor changes were incorporated into the document as HUD now provides a Spanish version. Fidelity National Title Group reported pre-tax earnings of $122.1 million with a pre-tax margin of 9.6 percent during the first quarter of 2010, the company reported July 22. Old Republic’s Title Group reported a $4 million profit during the second quarter of 2010, but remained in moderately negative territory for the first half of the year as claim and operating expenses outpaced revenue growth, the company reported July 22. Sue Reddy will be also serve as a risk management representative focused on supporting independent title agents as well as prospecting new title agency relationships. The underwriter has hired industry veteran Chris Strynar as regional manager to lead the new team. First American Financial Corp. will release second-quarter operating results on Aug. 3 and hold a conference call the same day at 11 a.m. Eastern. A key change contained in the financial regulatory reform bill is a provision that imposes civil penalties for violating any of the consumer financial laws, including RESPA. Why Should Title Companies Market to Consumers? Historically, title companies focused on lenders and real estate agents as their primary customers. But with market changes, that focus is expanding to include consumers. Read on to learn about opportunities for title companies to focus their efforts more specifically on homebuyers. The combination of credit and downpayment requirements for new borrowers and the reduction of allowable seller concessions from 6 to 3 percent could prevent some buyers from entering the market. Kevin Twellman and Nick Verde joined the company’s National Services Division in St. Louis as part of the business development team. Fidelity National Financial will sell several title plants and related assets in the Portland, Oregon, and Detroit, Mich., metropolitan areas, and in four other Oregon counties to settle Federal Trade Commission charges that its 2008 acquisition of three LandAmerica Financial subsidiaries was anticompetitive. The Administration's Housing Scorecard shows that, thanks in part to interest rates continuing at all-time lows, home affordability in the U.S. remains near the most attractive levels in 10 years. Independent mortgage bankers and subsidiaries made an average profit of $606 on each loan they originated in the first quarter of 2010, down from $890 per loan in the fourth quarter of 2009 and $1,088 in the first quarter of 2009, according to the MBA. Even though the oil spill disaster in the Gulf of Mexico threatens billions of dollars of real estate transactions and development, title and settlement service agents continue to embrace a “we will get through it” attitude as they struggle to ride out the economic downturn and slow-moving recovery. Legislation signed March 31 by Ohio Gov. Ted Strickland that went into effect June 30 brought significant change to the state’s oil and gas industry, including the ability to place a priority lien on a well if the owner fails to pay fees under the new Oil and Gas Law. The Georgia Supreme Court upheld the denial of a motion for a permanent injunction and writ of mandamus seeking to prevent a subdivision permit from being issued to a developer. The updated instructions are now available in an editable PDF file format and further facilitate the transfer of information from lenders to settlement agents in order to create an accurate, compliant HUD-1/1A. Paul Tyler, an attorney with the Des Moines-based firm of Dickinson, Mackaman, Tyler & Hagen and a member of ALTA, received the Award of Merit during the Iowa State Bar Association’s annual meeting. Richard Powers was named president and COO of DJSP Enterprises, which earlier this year acquired a Timios, a national title insurance and settlement services company. Closing.com adds escrow/settlement providers to its real estate closing services site. he Docket is a monthly TitleNews Online feature provided by ALTA’s Title Counsel Committee that reviews significant court rulings and other legal developments, and explains the relevance to the title insurance industry. Today’s review of a U.S. District Court of Wisconsin ruling highlights unique laws and regulations that apply to Indian tribes and lands. ALTA’s Title Insurance Political Action Committee continues to make significant progress toward reaching its goal of raising $250,000 in 2010. NextAce announced an expansion of its automated title software and services with the release of NextAce Connects, a virtual examination platform that provides instant access to all title orders. Old Republic International Corp. will hold a conference call at 3 p.m. Eastern on July 22 to discuss second-quarter results. Agents National Title Insurance Co. was recently approved as a member of the Federal Home Loan Bank of Des Moines. A judge for the U.S. District Court for the Northern District of Ohio recently ruled that HUD's Ten-part test used to determine whether an affiliated business arrangement (AfBA) is a sham under RESPA or whether it constitutes a bona fide provider of settlement services. The state joins 14 others banning the use of private transfer fees, which steal equity from homes and force homeowners to pay a large fee when selling their home. The association’s online Membership Directory proved highly beneficial for Virginia-based Reliant Title. David Martyn, vice president, associate senior underwriter and manager of the Stewart National Title Services office in Detroit, has been sworn in to practice before the U.S. Supreme Court. RamQuest Inc. announced that Mark Holley has been named vice president, national accounts and agency relations. Fidelity National Financial will release second-quarter 2010 earnings after the close of regular market trading July 21. Changes in many states are impacting ability to access information in a timely, cost-effective method. Read on for a look at a "dirty dozen:" examples of how many states and counties are denying access or increasing the cost to recorded documents, while other jurisdictions are making it more difficult and costly to file mortgage documents. Revised Good Faith Estimates appearing at settlement to bring a lender into tolerance limits after the lender has received a "final" HUD-1 from the settlement agent is not a change in circumstances that is permitted, according to HUD. North Carolina’s governor signed legislation last week that banned the future use of private transfer fees. Justin Ailes, director of government affairs for ALTA, will be the keynote speaker on the opening day of the annual Association for Title Information Management (ATIM) Conference. U.S. homes today are bigger with more bedrooms and bathrooms than 1973, according to the 2009 American Housing Survey released by HUD. The first quarter of 2010 proved to be better than the first quarter of 2009, as operating income increased $61 million (2.7%) and operating expense decreased by $24 million. The process to volunteer is simple and can be done online. While it remained in limbo whether a bill extending the deadline for closing tax credit eligible transactions would be passed, title agents and closers across the country took many steps to complete as many deals as possible by the deadline. Read on to learn how some agents deal with the looming deadline. Late Wednesday night, the U.S. Senate approved a temporary reauthorization of the federal flood insurance program until Sept. 30. Read on for a synopsis of the reform bill and possible impacts on the title insurance and real estate settlement industry. Arkansas Title Insurance Co., National Land Title Insurance Co. and Stewart Title Insurance Co. of Oregon have been merged with Stewart Title Guaranty Co. to increase operational efficiencies. According to the Mortgage Bankers Association, analysis shows that commercial real estate fundamentals are beginning to show signs of stabilization, though property and mortgage performance remains weak. Christopher Philips, president of Title Resources Guaranty, received the highest honor bestowed by TLTA. The HUD-1 is a consumer disclosure document, not a disbursement document, HUD officials reminded industry professionals. A federal appeals court ruled an Ohio woman may renew a motion for certification of a nationwide class action lawsuit over allegations a title insurance company violated anti-kickback regulations by paying millions of dollars to individual title companies and received written exclusive referral agreements in return. HUD published an interpretive rule under RESPA formalizing its position that real estate brokers and agents are prohibited from receiving fees for referring business to home warranty companies. An effort to extend the June 30 closing deadline for homebuyers who signed purchase agreements by April 30 in order to receive a tax credit worth up to $8,000 appears unlikely to succeed. Stewart Title Ltd., the underwriter for UK, European, Australian and New Zealand transactions for Stewart Information Services Corp., issued the title insurance policies for AEW Europe's and Tristan Capital Partners' acquisition of a portfolio of five warehouses and distribution centers located in Poland. Three Banks Closed in Florida, Georgia and N.M. The number of U.S. bank failures is now at 86 for the year as regulators shut down three more banks in Florida Georgia and New Mexico. According to the preliminary Market Share Analysis, title insurance premiums written during the first quarter of 2010 increased 4.3 percent when compared to the same period a year ago. WFG National Title Insurance Co., which is licensed in 33 states, opened its national headquarters in Lake Oswego, Ore.
An official with HUD said the department will switch to increasing enforcement of the new rules and reminded title and settlement agents how to handle inaccurate or confusing instructions from lenders. A 2009 ruling in favor of National Real Estate Information Services in an unauthorized practice of law case brought by the Real Estate Bar Association for Massachusetts Inc. has been vacated by the First Circuit Court of Appeals. The state's supreme court will now decide if non-attorneys can conduct “witness” or “notary” closings. Hawaii became the 13th state to ban private transfer fees, while legislation to prohibit the use of these fees is awaiting the governor’s signature in Illinois, Louisiana and North Carolina. The Chicago Title Company and the Chicago Title Insurance Company were ordered by a jury in San Diego to pay $5.7 million in punitive damages for the role some employees played in a $30 million real estate scam. Whether you are a title agent, escrow officer, attorney, operations manager, owner or underwriter, the agenda has something that will appease all needs. Some items on the agenda include a discussion on valuing independent agents by underwriters, earning national lender business and lender ratings for title agencies, mortgage subrogation, business operation best practices and the proposed NAIC Data Call. Title and settlement agents looking for an educational resource for homebuyers and borrowers seeking information on the new settlement statements can be found in HUD's recently updated Settlement Cost booklet. Some of the efforts fueled by TIPAC contributions include working to limit the authority of the proposed financial reform legislation on the title insurance industry; efforts to ban private transfer fees (also known as Wall Street Resale Fees); urging Congress to extend the June 30 closing deadline for homebuyers eligible for the $8,000 federal income tax credit; pushing Congress to reauthorize the National Flood Insurance Program; working with the NAIC on the proposed national agent data call. An amendment to New Jersey Assembly No. 559, sponsored by Assemblyman Ronald Dancer, would create a flat rate for all copies. BP has established a $20 billion escrow fund to pay claims filed by individuals or businesses harmed by the Gulf oil spill. Westcor's National Agency Division includes Barbara Allen, division manager; Sara Hewitt, vice president of national accounts; Kimberly Sledd, national agency representative; and Chris Skinner, national corporate coordinator. This is the first license awarded in TEAM's 38-state expansion plan, as the company will do business in Pennsylvania as TEAM Settlement Solutions. The company said it will concentrate on the detection and prevention of title and mortgage fraud throughout the United States. Is the new “Provider List” the same as the old “Approved Provider List” that some loan originators used? Are the lists different? Do the old “Approved Provider Lists” exist anymore and do they work the same way? Read on for a look at trends in the use of these forms. Because of the amount of time to process short sales and foreclosures, as many as 75,000 consumers may be unable to meet this deadline. Two bills introduced in Delaware by Rep. Dennis E. Williams would consolidate the three county recorders into one statewide recordation system. Mississippi joins Arizona, Florida, Iowa, Maryland, Minnesota, Missouri, Kansas, Ohio, Oregon, Texas and Utah in banning these fees. The American Land Title Association issued a press release in response to an organization’s investigation into the title insurance industry, warning consumers about groups that claim to save them money on fees associated with obtaining a mortgage. Williams Title Guaranty and Escrow Agency specializes in providing title insurance and escrow services on lender-owned REO and is a designated closing agent for the U.S. Department of Housing and Urban Development, handling HUD closings in Colorado. Louis Chinappi is responsible for fostering and managing relationships with lenders, Realtors and builders throughout Massachusetts, while assisting in recruiting new title insurance agents. The Docket is a monthly TitleNews Online feature provided by ALTA’s Title Counsel Committee that reviews significant court rulings and other legal developments, and explains the relevance to the title insurance industry. This installment reviews a Minnesota Supreme Court ruling regarding the risks associated with using a Tract Index to conduct a search. The American Land Title Association joined several other associations urging Congress to immediately reauthorize the National Flood Insurance Program (NFIP), which expired May 31. The president of the Ohio Land Title Association called the governor’s signing of the bill a victory for the title insurance industry and eliminates unnecessary risk for lenders, homeowners and land title professionals. The U.S. Department of Housing and Urban Development awarded new contracts to 23 companies to serve as Asset Managers and 32 other firms to serve as Field Service Managers. Forbes was at it again making another uneducated attack on the industry in an article posted online recently. Read on for ALTA’s response. Resource Title Agency is delivering responses to requests for proposal for commercial real estate transactions using hyperlinked commitments, technology traditionally offered by national underwriters. The revised outlook and rating affirmations of First American was attributed to the company’s improvement in surplus, due largely to improved operating results, cost reduction initiatives and consistent net investment income. Currently, HUD-1 data points fall into the optional category and will not be required for loan delivery on Sept. 1, 2011. Read on for more details about the new loan delivery data requirements. Nine other states already ban private transfer fees, while legislation in Ohio is awaiting the governor’s signature. Making Home Affordable Program rule changes went into effect June 1 making it possible for homeowners to seek mortgage modification while in an active bankruptcy case. Ingeo Systems and NetDirector recently announced an integration partnership that streamlines and automates transaction-based processes associated with the electronic recording of real estate documents. As a business owner or manager, do you ever find yourself dealing with an employee whose bad attitude negatively affects your profitability? A seminar offered through ALTA’s Land Title Institute will provide dozens of real-world strategies to remove negativity in the office. HUD wants input on the possible revision or clarification regarding the use of affiliated businesses after the department received several consumer complaints about programs offered by homebuilders. This bill was enacted by the Maryland General Assembly to specifically address AfBAs and to bring the matter into the forefront of issues relating to the title industry in the state. The guidance reflects the Title Insurance Division of the Indiana Department of Insurance interpretation of the process to be used in production of the new HUD forms in compliance with Indiana law and new RESPA regulations. The national provider of real property research solutions has added Virginia and Washington, D.C., to the company's Mid-Atlantic footprint. The ratings are being affirmed and the outlook is being revised to stable from negative due to the group's stronger capitalization in 2009 as compared to 2008 as evidenced by a significant improvement in its underwriting leverage measures. First American Financial CEO Dennis Gilmore said the company has simplified its structure, standardized approaches to processes centralize administrative and back office functions and decentralized customer touch points. Read on for more on the company’s outlook following the spin-off of its business data and analytics operation. Congress won’t address the expiration of the program until it returns from recess June 7, when several bills to extend the program will be considered. The Ohio Land Title Association worked with a coalition of several other groups in support of House Bill 292, which passed both chambers with overwhelming support. Brooks Yeager will lead the development, sales and marketing efforts of Closing Market, RamQuest’s business-to-business, system-to-system network that allows participants to order, exchange, fulfill and market products and services required in the real estate closing process. Fidelity National Financial has appointed George Scanlon as chief operating officer. Easy Soft said updates to its legal practice management software offers new features that eases compliance with the new RESPA Rule, including smart itemization and set offs, addendum page flexibility and an automated HUD-GFE comparison sheet. The conference schedule offers a variety of educational sessions in multiple formats to address timely topics for the land records industry, including legislation impacting access to public records, budget constraints impacting ability to serve customers and issues with implementation of eRecording. First American Financial and CoreLogic announced their formal separation into two independently publicly traded companies. An Ohio-based title agency has reached out to Congress after the U.S. Government Accountability Office rejected its challenge to the evaluation process used to award contracts for closing services associated with HUD foreclosure properties in the Buckeye State and that HUD awarded only one contract despite soliciting the services of two companies. To mark 25 years in business, Hollerbach & Associates decided to partner with the Texas Historical Commission to advocate the Texas Historical Courthouse Preservation Program. The ALTA Technology Committee announced the publication of a white paper contributed by RamQuest and entitled "Why Use Social Media?," which covers the benefits and potential impact of using social media, as well as a review of some of the most popular social media sites. Sen. Bill Seitz said that while he respected creative financing, 99-year private transfer fee covenants can create clouds on title and cause many future problems. The legislation would authorize the state’s attorney general to prosecute instances of the unauthorized practice of law. Legislators and regulators need to hear the industry’s story. The goal of the TItle 101 training is to describe each step in the title-avoidance process from the search through the closing and the issuance of the policy. Read on to learn how the training has improved the industry's relationship with departments of insurance and how to schedule training in your state. Beginning July 1, no foreclosing mortgagee or mortgagee who acquires the property through a foreclosure proceeding shall require, direct or indirectly, as a condition of selling the property, that the buyer purchase title insurance or escrow service from a particular title insurer or escrow depository. Mike Pryor, who served as CEO and president of Lenders Title since 2000, said he has no immediate plans for his future, but plans to remain connected to the title insurance industry. Last week, ALTA helped develop a joint teleconference with the Minnesota Land Title Association, Minnesota Association of Realtors and three state legislators urging Minnesota Gov. Tim Pawlenty to sign the bill banning private transfer fee covenants. You can access audio from the call here. This year’s annual convention will be held Oct. 13-16 at the Manchester Grand Hyatt in San Diego, Calif. Register by June 1 and save $150. Agents National Title Insurance Company announced the addition of Peter Klein and Robert Buchheit to its board of directors. The deadline to submit proposals for the Annual Convention is Friday. Read on for more details and examples of approved content. The regulatory approval clears up the last big hurdle for First American as it prepares for a June 1 spinoff of its title insurance business from its information services division. Check out images from the 2010 Business Strategies Conference, which was held May 2-4 in St. Louis. Handouts and audio recordings from all of the sessions also are available. The Webinar will allow settlement agents and lenders to discuss current RESPA issues and have questions answered by HUD. In order to provide clearer guidance on how to disclose transfer fees, ALTA’s RESPA Implementation Task Force has provided a breakdown of how transfer fees are handled in each state. Read on. Title Industry Veteran Named Interim Insurance Superintendent in N.M. The New Mexico Public Regulation Commission (PRC) has named its second interim insurance superintendent in less than three weeks since Morris Chavez announced in resignation May 4. Read on to find out which 35-year industry veteran will head up the state's insurance department. After launching its national commercial division last year in Chicago, Resource Title Agency expanded its commercial footprint into the D.C. market. Wisconsin Gov. Jim Doyle is expected to sign legislation at the end of May that will change the state’s recording fee structure from a per page fee to $25 per document in most counties. The North Star State joins 10 other states that have legislation that either bans or limits the use of private transfer fees. Hamilton and Hardin counties both cite privacy concerns and are not providing records to the state’s public electronic land database system. According to the charges, the owner of A.N. Title Agency and two other conspirators used the fraudulent funds to purchase a Mercedes Benz and other automobiles, multiple trips to Aruba, a trip to Poland, furniture, clothing, and purchases from QVC and the Home Shopping Network. Westcor Land Title Insurance Co. added four positions to further support its national growth. The Texas Department of Insurance granted Linear Title & Closing its title agent license in late April. Poll Results: What is causing you the most difficulty or frustration in closing transactions with the new GFE/HUD-1 forms? During the first quarter of 2010, ALTA polled membership on what was causing the most difficulty or frustration in closing transactions with the new GFE/HUD-1 forms. Get the results. The survey fee provides a great example of the complex nature of determining where to place charges on the new HUD-1 form. Read on for guidance. Answering a joint letter sent by the American Land Title Association and National Association of Realtors, the U.S. Department of Housing and Urban Development clarified its position that private transfer fees clearly violate HUD's regulations for FHA-insured mortgages that prohibit legal restrictions on conveyance and require clear marketable title. Here’s a list of the latest industry professionals to become ALTA members and associate members. Thank you for your support. Knight-Barry Title Services’ acquisition of Absolute Title Services gives the company offices in nine of Wisconsin’s 10 largest cities and allows it to provide title services in all 72 counties. Nearly a month after reshuffling its leadership and moving its long-time director to a new role, the U.S. Department of Housing and Urban Development named a new director of the Office of RESPA and Interstate Land Sales. According to results from the ALTA’s 2009 Market Share Analysis, the industry reported a 4.5 percent decrease in title insurance premiums, falling to $9.6 billion from $10.0 billion in 2008. The integration with LPS SoftPro for Stewart’s network of title insurance agencies will help users increase efficiency, automate various parts of workflow and better manage forms. Advantage Title says its iPhone application will allow users to retrieve complete, real-property details, sales comparables, transaction history, plat maps, tax data and other information. According to a recent report, nearly every copy machine since 2002 has been built with a hard drive that stores images of every document scanned, copied or emailed by the machine. An amendment to Senate Bill 82 in the House of Representatives added at the 11th hour, without a committee hearing or prior notification of the action, allows recorders to charge up to half the fee of certified copies for "non-certified" copies. Stewart Title Guaranty entered into a settlement agreement with the commissioner of insurance, which resulted with most of the significant charges against the company being dropped. So far this year, TIPAC has received $163,000 in contributions. At this time last year - our record year in contributions - TIPAC received $89,000. Did you miss a session at the 2010 ALTA Business Strategies Conference? If so, you can still listen to the informative educational offerings and view the session materials by accessing ALTA's Online Meetings Proceedings. The application allows customers to view up-to-date transactional data, documents, tasks and contacts within the transaction to enhance and provide transparency in the closing process. Closing.com, a source for closing services on the Web, has partnered with Zillow Mortgage Marketplace to provide borrowers access to local, real-time estimates of all closing costs. The strategic plan has five main goals including Strengthen the housing market to bolster the economy and protect consumers, meet the need for quality affordable rental homes, utilize housing as a platform for improving the quality of life, build inclusive and sustainable communities free of discrimination, and transform the way HUD does business. In the first quarter of 2010 refinancing borrowers overwhelmingly chose fixed-rate loans, regardless of whether their original loan was an adjustable-rate mortgage or a fixed-rate, according to Freddie Mac's quarterly Product Transition Report. The company’s AgencySecure program aims to help title agencies reduce title claims, escrow theft and mortgage fraud. While the new RESPA Rule provides clear guidance on where to put fees for owner’s title insurance, state law is varied on the definition of premium and is creating confusion. Read on for guidance from ALTA’s RESPA Implementation Task Force. An appeals court upheld a district judge’s ruling that the title insurance underwriters did not conspire to artificially set high rates. Keller Williams Realty announced a partnership with Mayfair Title Corp. at its new location in Elm Grove, Wis. The software provider said the update includes enhanced 2010 HUD-1 features. Mike Pryor received the Michael F. Wille TIPAC Award for Outstanding Achievement during the 2010 Business Strategies Conference. The Baseball Hall of Famer shared many baseball memories and offered some hilarious jokes during the closing luncheon of the 2010 Business Strategies Conference in St. Louis. In an order issued by Washington State Superior Court Judge Paula Casey, title insurers could be held responsible for illegal inducements offered to solicit title insurance business by one of its appointed agents. Morris “Mo” Chavez, who served as superintendent since October 2006, resigned his post effective May 4. According to the lawsuit, the owner of Central Alabama Title would change the title of a property to fraudulently reflect that the person applying for a refinance loan was the current property owner. The Title Insurance Workgroup will continue work on the Version 3.0 Implementation Guide, update the eTitle Policy for version 3.0 and review the new eHUD produced by the Origination group for title requests. As the governors in Maryland and Iowa signed legislation banning the use of private transfer fees, seven other states have bills pending in their legislature. Despite a litany of economic setbacks, including the loss of trillions in household wealth and the failure of several major U.S. financial institutions, many opportunities await the title insurance industry, ALTA’s president told attendees Monday during the opening general session of the 2010 Business Strategies Conference. Read on for coverage from the leadership general session that featured Pat Stone of Williston Financial Group, Rob Chapman of Old Republic National Title Insurance, Cara Detring of Preferred Land Title and Frank Pellegrini of Prairie Title. Future of ALTA: Dues Restructuring? Offering an inside look at the association, CEO Kurt Pfotenhauer discussed several items being addressed to improve ALTA’s value proposition, including restructuring of membership dues, building stronger relationships with state associations, revamping conference content and membership benefits. Many exhibitors at the 2010 Business Strategies Conference showcased the benefits of their products during vendor demo sessions prior to the opening of the conference. Although premiums resulting from purchase transactions increased versus the prior year period, a sharp decline in refinance premiums impacted results. ALTA membership has increased more than 60 percent since 1999, with nearly 90 percent of its members being small agents. Read on for the details. The company named Renee Haglund Tierney as vice president and manager of its Minneapolis national commercial operations and will be focus on expanding market share in the mid-western region. The number of counties that are electronically recording documents surpassed 500 during the month of April, according to the president of the Property Records Industry Association. The company’s technology provides real-time fees from local, regional and national settlement service providers in the relevant categories for sections 4 through 8 on the Good Faith Estimate. Among the changes, the new regulations impacts charges for title commitments and property reports, clarifies what is considered a reasonable search and exam and states that title companies and agencies are no longer permitted to invest the funds they hold for other parties without first receiving written approval from the parties. Read on find out more on the new regulations in Colorado. The state amended the Mortgage Bankers and Brokers Act to require licensing for closing agents effective July 1, 2011. Read on to learn who will be exempt and which job functions are specifically excluded from the definition. The company’s title division reported a spike in premiums generated through its agency channel as it continues to focus on strategic markets. The company reported it continued to reduce expense and improve its independent agency channel during the first quarter of 2010. Read on to learn one alternative Stewart utilized to save money instead of eliminating jobs. Rod Alba, vice president and senior regulatory counsel for Mortgage Finance for the American Bankers Association, will join a panel of ALTA RESPA Implementation Task Force members to share insight into how the industry is adapting to the new GFE/HUD-1. Xerox’s virtual repository directly connects to the Mortgage Electronic Registration System e-registry system, giving loan participants instant access to information related to the status of an e-mortgage. For a third straight day, Senate Republicans on Wednesday blocked the start of debate on financial regulatory reform on the Senate floor. Read on to learn how ALTA is working to protect the title insurance industry's interests. Recent updates to HUD’s FAQS now allows tolerance cures to be handled with an adjustment to the out of tolerance charge on page 2 and another method that involves a credit for the cure amount in lines 204-209 on page 1 of the HUD-1. Read on to learn why the Task Force believes that putting the tolerance cure amounts in a single location on page 1 of the HUD-1 would be easier to program for and to review than showing adjusted charges in several locations on page 2. The title agency, which was purchased by First American in 1998, is now called First Title Co. of Waco. AmeriTitle, which ranked sixth among small companies with 100 or less employees by Idaho Business Review Magazine, has 10 offices in the state and has approximately 75 employees. The American Land Title Association’s Land Title Institute will provide a webinar May 25 that will address the need for the female vision in order to provide a team-based, service-oriented and interconnected global business environment. The AgentFirst app allows users to look up property addresses while in the field to gain access to property information and characteristics, historic sales information, tax data and more. Kyle Rank will be responsible for developing relationships with agents, and marketing and management of Alliant National’s Missouri agency programs, as well as developing educational programs for agents and their customers, and licensing, underwriting and expansion into adjacent states. Ohio-based Millman Surveying introduced a new platform that allows title agents and attorneys to review and interact with surveys and other property information. Recently enacted fee tolerance changes to the Real Estate Settlement Procedures Act continue to pose the greatest mortgage compliance concern in 2010 among lenders, according to an annual survey. Fidelity National Financial’s title division reported earnings of $22.9 million during the first quarter of 2010, buoyed by a shift in more resale orders and continued cost reductions. Existing approved FHA mortgagees must meet the new net worth requirements by May 20, 2011, while companies applying for approval must meet these requirements effective June 21, 2010. The ALTA Marketing Kit, which was created for members to educate real estate professionals, lenders and consumers about the value of title insurance, includes many useful pieces, such as 30 and 60 second advertising spots that can be customized with your company’s information and message. Both owners of the now defunct Guaranty Title have admitted their participation in a scheme to defraud financial institutions of more than $2.7 million through a series of illegal financial transfers related to stolen escrow payments. First American Corp. and Fidelity National Financial were both named to the Fortune 500 list for 2010. Classes offered by ALTA's Land Title Institute provide CE credits in several states. Read on to learn how you can obtain needed CE credits without leaving your office. Have You Scheduled a Tour of Your Agency? ALTA members are encouraged to reach out to their U.S. Senator, U.S. Congressman, state legislators or regulator to ask them to come to your office to learn what the industry does to protect the real estate transaction. ALTA has created a soup-to-nuts program to help you plan and conduct an office tour. Read on to learn more. The American Land Title Association’s Standard Procedures and Controls for the Title Industry, which will help improve the title industry by imposing consistent and fair standards against which every company is measured, have been finalized and published following a review and comment period. Plantation, Fla.-based DJSP Enterprises Inc., a provider of processing services for the mortgage and real estate industries in the United States, signed a definitive agreement to acquire Timios, Inc., a national title insurance and settlement services company. President Obama signed into law an extension of the National Flood Insurance Program through May, 31, 2010. The law extends the flood program retroactively to Feb, 28, 2010, when the previous program expired. Read on for information to help make sure buyers are ready by April 30 for all closings. Investors Title Insurance Co. promoted Michael Aiken to senior vice president, compliance officer, and senior counsel – national markets; Joanna Tillottson to senior vice president – agency and branch operations; and Brandee Garren to vice president – underwriting and operations support. Chicago Title, Stewart Title and Old Republic all offered recognition for TitleVest’s ability to utilize its proprietary technology to ensure all critical closing and post closing functions are handled efficiently and accurately. According to ALTA's RESPA Implementation Task Force, HUD's latest FAQs update resolves the smoldering debate on the correct way to disclose transfer taxes. Read on for guidance. The Title Industry on Twitter: Now What? Many executives, once receptive to the potential of Facebook, Twitter and LinkedIn, but burned by time wasted with few business-based results, now may be viewing these as the marketing equivalent of the hula hoop or wide-legged jeans: just another fad of little use to respectable businesses. Read on to learn if the title insurance industry is in the early phase of a social media backlash. Effective with foreclosures referred on or after May 1, 2010, MERS must not be named as a plaintiff in any foreclosure action, whether judicial or non-judicial, on a mortgage loan owned or securitized by Fannie Mae. The failure of a now-bankrupt escrow company to pay homeowners’ taxes and insurance bills has resulted in new legislation. Find out which operations are now allowed to handle escrow accounts in the Hoosier State. The former owner of a Florida-based title agency was sentenced to five years in prison for stealing more than $660,000, while the owner of a now-defunct title company headquartered in Nixa, Mo., pleaded guilty this week for his role in a $2.7 million wire fraud conspiracy and money laundering scheme. In her new book, award-winning real estate guru Ilyce Glink offers readers information on how to safely get back into the housing market, including advice to purchase an owner’s title insurance policy. The study entitled, “What Happens to Household Formation in a Recession,” analyzes the impact of economic and housing conditions on household formation and how the recent recession has affected Americans’ propensity to form new households, mobility trends, and changes in the rate of overcrowding. Fidelity testified April 12 before the Georgia Supreme Court appealing a ruling from the court of appeals that said the underwriter was responsible for a claim involving a fraudulent transaction. The long-time Director of the Office of RESPA was transitioned to a new role with the U.S. Department of Housing after leadership changes were announced. Read on to learn who is stepping in as acting director. The underwriter agreed to pay a $62,000 fine following a 33-month market conduct examination by the insurance department. The American Land Title Association support's the agency's broader effort to modernize FHA’s application process. The electronic recording provider added 30 counties to its e-recording network. The SmartGFE Service provides real-time fees from local and national vendors in nine categories such as title insurance, settlement services, closing attorneys, home inspections, pest inspections and appraisals. Old Republic will announce its first-quarter results on April 22, while Stewart will release its financial condition on April 29. A vendor management company jointly owned by First American and KeyBank will close after the lender started sending its settlement work to another provider in December. Since transfer taxes are a zero tolerance item, and more often than not are a sizeable amount, the failure to disclose transfer taxes in the GFE as a borrower pay item, can have significant financial consequences to the lender if the “improper” disclosure and handling of these taxes triggers a tolerance violation. Read on to learn how these fees should be handled. The American Land Title Association announced final publication of forms that were approved by the Board of Governors on Feb. 3, 2010. DBL Law opened Excel Title Services, which is licensed in Ohio and Kentucky. Fidelity National Financial will release its first-quarter 2010 earnings after the close of regular market trading on April 21. RedVision, a national provider of real property research and data solutions, announced that Tom Allbee has joined the company as vice president of operations. The U.S. Department of Housing and Urban Development released another update to its RESPA Rule FAQs on April 2. This update provides further clarification to three items on the GFE and how to cure tolerance violations. With the unsteady market, title companies must continuously gauge order counts and maintain the appropriate number of employees to handle the fluctuating volume. Because employee costs are such a dominate portion of an agency’s expense, hiring the right person is vital. Read on for tips to help you ensure successful hiring. North Dakota Guaranty and Title Co. recently announced it expanded its offerings to the oil and gas industry in North Dakota and also named a chief operating officer. The FHA will issue regulations to increase the net worth requirements of FHA-approved lenders, strengthen lender approval criteria and make lenders liable for the oversight of mortgage brokers. Amarillo National Bank reported it will open two Circle A Title offices in an effort to provide a one-stop shop for its customers. The First American Corp. will release its first-quarter operating results on April 29. The former office manager of a new defunct title agency in Indiana was charged last week in U.S. District Court with three federal crimes for allegedly stealing $1.6 million from the company. A subsidiary of Illinois-based Attorneys’ Title Guaranty Fund has found success in the foreclosure auction market. Now, this business is under attack as sheriffs and county officials want the auction business back. Mortgage Company Selects Exclusive Settlement Agent for Residential Deals (SUMMARY) American Financial Resources Inc., a nationwide mortgage lender, has selected Timios Inc. as its exclusive agent to conduct closings and escrow services for all residential mortgages where permitted by state and local laws. John Bell, a long-time title insurance industry veteran in Kansas and community leader in the Wichita area, passed away March 25 at the age of 79. The regional underwriter’s premiums written increased from $45.6 million in 2008 to $90.7 million last year. Freddie Mac reported the interest rate for 30-year fixed rate mortgages averaged 5.08 percent with an average 0.7 point, up from last week when it averaged 4.99 percent. Stewart has joined other leading companies from the registry, cadastre and GIS, GPS surveying and satellite imagery sectors to discuss ways to improve land records administration in Latin America and the Caribbean. While Congress adjourned without extending the National Flood Insurance Program. Read on to see how this could impact closings on properties within a special flood hazard area. To highlight the importance of standardized policy forms, ALTA will periodically provide some commentary regarding the evolution of ifs forms since the adoption of its first owner’s policy in 1959. Read on to see how the forms evolved during the 1970s. The closures bring the number of names on the FDIC’s failed bank list to 41 for the year. Find out which banks were impacted. Whitey Herzog, best known as manager of the St. Louis Cardinals and Kansas City Royals, will be the featured speaker during the closing luncheon of ALTA’s 2010 Business Strategies Conference in St. Louis. The directive’s new guidelines have servicers struggling to meet borrower review schedules and communication deadlines. Sharp Equity reported it will issue a full commitment for title insurance with no conditions before clients pay for properties. The 2010 Business Strategy Conference is an ideal event for title agents and abstracters. If you're looking for the latest on RESPA regulations, strategic management tips, how to spot unethical deals or learn new effective marketing tools, this is the event for you. Check out he registration brochure for a complete list of scheduled sessions. HUD Deputy Assistant Secretary Vicki Bott addressed many outstanding issues surrounding the new regulations during a webinar, including transfer fees, worksheets, tolerance cures and itemization of fees. Read on to find out what she said about the validation of lenders’ accuracy to the GFE and HUD-1 tolerances. The association wants HUD to clarify its position prohibiting the use of private transfer fees for FHA-insured mortgages and oppose private transfer fees for other mortgages as well. Huntington Beach-based Michaelson, Connor & Boul will be responsible for ensuring that FHA-approved lenders and loan servicers convey foreclosed properties to the FHA in acceptable condition. This includes performing title reviews. TEAM Nation Holdings appointed 28-year industry veteran Raymond Arias as president of its newly formed division that will focus on providing settlement services and ancillary real estate services to high volume lenders and mortgage brokers serving the national marketplace. For all mortgage loans that are modified pursuant to an Alternative Modification, the servicer must ensure that the modified mortgage loan retains its first lien position and is fully enforceable. Read on for title insurance requirements. The two attorneys are looking to capture marketshare throughout the five counties of metropolitan Detroit. Innovative companies can overcome new HUD Rules and a poor economy by seeking to harvest markets of opportunity. Read on for a few tips. The complaint requests the court to declare that the Fund is impaired or insolvent and to order Department of Financial Services to initiate delinquency proceedings to liquidate or rehabilitate it, while also force the termination of certain activities and services of the joint venture with Old Republic. The marketers and title agency were accused of offering an education program to real estate agents and lenders that was deemed not exclusively related to title insurance business. The report cites $823.6 billion in funding the company provided last year to help keep the single-family and multifamily mortgage markets operating. The MISMO Version 3.0 Reference Model was published as a Candidate Recommendation in December 2009 and is available for implementation by the industry. The number of people employed in the title insurance industry has been drastically reduced in the past few years, largely due to the economy. However, the economy will not be like this forever. When business starts to pick up again, it will be the wise supervisor that finds innovative ways to train new employees. Read on to see how agents and underwriters have used the board game Title Triumph as an education tool. Title agents looking to find the latest tips on how to grow market share, streamline their operations or get up to date on compliance changes will want to attend ALTA’s 2010 Business Strategies Conference, being held May 2-4 at The Hyatt Regency in St. Louis. Washington State passed a new law last week that aims to protect consumers and establish guidelines regarding the handling of escrow funds. The United States Court of Appeals for the Ninth Circuit determined in a March 9 opinion that Section 8(b) of the Real Estate Settlement Procedures Act does not prohibit overcharges. First American announced the leadership team of the Information Services Group and also plans to acquire the minority ownership of First American CoreLogic. Four states now ban the use of private transfer fees, which require consumers to pay thousands of dollars to third parties that hold no ownership interest in the property for the right to buy or sell real estate. Check out a slideshows from all the activities during ALTA's 2010 Federal Conference and Lobby Day. Reprints are available from all the events from the informative sessions with HUD and NAIC staff to meetings with legislators on Capitol Hill. While the title industry's lender partners continue to evolve, a variety of new models of real estate companies are emerging throughout the country. Read on to learn what three real estate groups title agents should focus on to get new business. Four years ago, 213 cities were overprices, a report indicated. Now, just 87 markets are overvalued, according to Global Insight and PNC Financial Services. Team Title expects to conduct direct title insurance and settlement services in up to 35 states in 2010. The Ratings firm said the projected decline in origination volume will cause title industry revenue to decline by as much as 15 percent. Check out a list the latest members of the American Land Title Association. The American Land Title Association's Small Agents and Abstracters Forum will meet from 9 a.m. to 4 p.m. EST, March 21 at the Marriott Cincinnati Airport to discuss topics impacting operations of similar size. Utah is on the verge of becoming the fourth state to ban the use of private transfer fee covenants, which require consumers to pay thousands of dollars to third parties that hold no ownership interest in the property for the right to buy or sell real estate. While overall employment in the insurance sector lost another 7,600 jobs in February, the title insurance industry added jobs last month, the U.S. Bureau of Labor Statistics reported. The Internal Revenue Service (IRS) launched a three-year, random employment tax audit initiative of up to 6,000 companies large and small, focusing on worker classification, payroll tax practices/reporting, fringe benefits and executive compensation. Tom Carpentier will be responsible for directing and managing the day-to-day operation of SSIS, which offers a variety of insurance protection products. TI Services recently upgraded its title insurance Web site and its TRACcalculator service to provide itemization of title costs and the completion of applicable title related settlement charges for the new GFE/HUD-1. Rekon’s lien release and assignment processing software has been integrated with Simplifile’s electronic recording system. Title agents can take advantage of reduced charges to access conferencing solutions from audio-conferencing to web-conferencing platforms such as WebEx and Microsoft Live Meeting. Beyond finding business with FHA lenders, title agents are urged to continue going after correspondent lenders such as smaller banks and credit unions, who are likely to be a major force in mortgage lending in 2010. Fannie Mae has released a bulletin summarizing the changes contained in the January 2010 Fannie Mae Real Estate Purchase Addendum. The FHA recently sent out a mortgagee letter informing lenders the upfront mortgage insurance premium will increase 2.25 percent for loans issued on or after April 5. Agents National Title Insurance Co. recently made two appointments, adding an underwriting counsel and a state area manager. The Title Insurance Workgroup also met during the meeting and is working on several initiatives, including a joint project with the Origination Workgroup. While providing some guidance to the new rule, Ivy Jackson, director of the office of RESPA, complimented ALTA and its taskforce for proactively working with the department and other stakeholders in finding solutions and providing education to the new rule. Use of social media has ballooned over the past year, and if used correctly, title industry professionals can harness its untapped marketing potential, build relationships and recruit. Read on to learn how one agent utilizes social media sites to generate business. Two lenders in Florida contacted the FDIC reporting that counterfeit cashier's checks bearing the institutions’ name are in circulation. The 2011 Annual Convention will be held in Charleston, S.C., which offers horse-drawn carriage rides, mansions and museums, historic monuments such as Fort Sumter, where the first shots of the Civil War were fired, and a number of magnificent old plantation houses, such as the 18th century Middleton Place. Accurate Title Group said its TAG GFE provides instant, accurate calculations for purchase, refinance and home equity transactions in all 50 states and all counties for title insurance premium, endorsements, CPL fees, search, closing fees, recording costs and transfer taxes. The panel told attendees of the 2010 ALTA Federal Conference and Lobby Day the purpose of the agent data call is to gather a better understanding of what's happening at the agent level. The information the group seeks falls into four buckets: risk avoidance, business profit, business expense and loss. Attorney General Greg Abbott took the opportunity to explain the value of purchasing title insurance after announcing a developer had been charged for selling homes that had undisclosed liens, which resulted in homebuyers facing foreclosure. ALTA joined 12 other trade associations in submitting a letter to Sens. Chris Dodd and Richard Shelby asking the U.S. Senate Committee on Banking to consider the enormous challenges facing commercial real estate and the uniqueness of the markets that finance the $6 trillion sector when exploring financial regulatory reform proposals. Knowledge in multi-state deals and the scalability to meet deadlines helped it recently helped Rockville, Md.-based Closeline Settlements close three major national projects, including a large refinance of 18 health-care centers in Florida, the purchase of 41 healthcare centers located across the country and a lender workout with more than 5,000 properties in 15 states. The properties involved in the fraudulent warranty deed transfers were almost always vacant lots with unpaid back taxes due and/or with weed liens filed against them by the city of Fort Worth. Check out a selection of photographs from the 2010 ALTA Federal Conference and Lobby Day. Photos were taken during Sunday night's opening reception and during several committee meetings held during the past couple of days. Several legislative and regulatory issues impacting the industry and ALTA’s efforts to protect the industry’s interests were addressed at the Government Affairs Committee meeting during the 2010 Federal Conference. During the 2010 Federal Conference, ALTA President Mark Winter announced a new program that aims to educate policymakers on the value of title insurance. By putting a real face on the land title industry, we can make a difference in helping policymakers understand the value title insurance provides. Mike Fratantoni, vice president of research and economics for the Mortgage Bankers Association, provided an economic and mortgage forecast to those attending ALTA’s 2010 Federal Conference and Lobby Day. While the American Land Title Association continues to work closely with the National Association of Insurance Commissioners’ Title Insurance Issues Task Force as it attempts to develop a title agent data call, the Pennsylvania Department of Insurance issued its own data call last week seeking to collect financial data from nearly 500 selected title agents. A group of people filed a patent nearly decade ago that describes a method for creating title insurance for a number of intellectual property asset classes, including domain names. Efforts to continually centralize operations and reduce expenses helped First American Corp.’s financial services group, which includes title insurance, report a $44.5 million profit during the fourth quarter of 2009. Doloris Hunt, who retired from Louisville Title Co. after 49 years as vice president, passed away at the age of 78. The Interthinx fourth-quarter 2009 report indicates that property valuation fraud is up more than 100 percent from two years ago as schemes involving short sales, REO inventories, “wholesale” flipping, and refinancing by borrowers whose equity has been impaired by falling real estate values continue to drive this index. Although the economy has been growing lately, fallout from the recent recession continued to negatively impact commercial real estate sectors in the fourth quarter, but there is hope for some improvement next year, according to the National Association of Realtors. The new addendum states that a closing shall be held at a place selected and approved by the buyer and eliminated language indicating the purchaser pays all of the transfer taxes as a result of the conveyance of the property. The ALTA Board of Governors agreed to engage in stopping private transfer fee covenants because they increase risk for lenders, homeowners, land title professionals and make the transfer of property more costly and less certain. Read on to learn what ALTA is doing to help ban these private transfer fees. This meeting provides an unparalleled opportunity for small agents and abstracters to meet with peers and freely exchange ideas, experience and opinions on subjects that impact your business today. To compress the time for completing a short sale, or implementing a deed-in-lieu, the company said title and settlement teams work to identify any potential title issues and necessary third-party payoffs to immediately begin curative title work. TitleVest’s new offering provides attorneys needed due diligence of Board of Director minutes and interview of the managing agent. Stewart Information Services reported a profit during the fourth quarter of 2009 as the company’s title operations took advantage of increased market share, continued to reduce expense and refined its agency network. An improved claims climate and continued reduction in operating expense helped North Carolina-based Investors Title Co report a profit during the fourth quarter of 2009 and for the full year. Colorado Escrow & Title said a partnership with title production software provider RamQuest Inc. has provided a tremendous asset in becoming educated and prepared to handle the new GFE and HUD-1 forms. The company said RESPA-compliant calculators are rolling out nationwide through Stewart Title offices and through Stewart Title Guaranty’s network of agencies. The company provides newly filed court case information to title plants. The risk that Congress would retroactively change the estate tax rate will create a "hidden" lien on the title of any property of a decedent who died on or after Jan. 1, 2010. Old Republic agreed to pay the California Department of Insurance $399,000 for allegedly charging lenders rates different than the rating rules that had been approved on certain residential refinance title insurance rates and escrow fees, while Fidelity settled a $500,000 fine with the Missouri Department of Insurance surrounding allegations that four of its underwriters charged consumers incorrect fees and used unapproved insurance policies. The ALTA Technology Committee is looking for white papers, best-practices guide or how-tos on subjects of importance to title professionals and small-to-medium size business owners. Alexander Hart Halff, the son of the founder of Alamo Title Co and a former president of the Texas Land Title Association passed away last week at his San Antonio home. Canyon Title named Jodi Murray as senior escrow officer. Refinancing borrowers overwhelmingly chose fixed-rate loans, regardless of whether their original loan was an adjustable-rate mortgage or a fixed-rate, according to Freddie Mac. It is believed a landmark decision in 1868 against a property owner provided the impetus for a group of Pennsylvania conveyancers to form the first title insurance company. Read on to learn how ALTA’s policy forms evolved during the 1960s. Joel Mandell, a real estate attorney for 43 years and special counsel for Connecticut Attorneys Title Insurance Co., is the current president of the New England Land Title Association, which represents Connecticut, Maine, Massachusetts, New Hampshire, Rhode Island and Vermont. Read on to learn about Joel Mandell and a few issues impacting the New England states. Andrew Rennell has been promoted by Resource Title to the position of chief operating officer, where he will oversee global day-to-day operations of the Independence, Ohio-based title and settlement services firm. The First American Corp. will release operating results for the fourth quarter of 2009 on Feb. 25 and host a conference call later the same day at 11 a.m. ET. New Jersey and Pennsylvania title professionals will converge for their annual convention this June 10-13 at the Sagamore Resort in Bolton’s Landing, N.Y. In meeting market demands and changes, the ALTA Board of Governors approved recommendations to revise seven existing forms, adopt four new forms, and decertify one form during a meeting on Feb. 3. The underwriter folded two companies it acquired in 2008 from now bankrupt Mercury Cos. under the Fidelity National Title Insurance brand. The company said its next-generation predictive valuation software is designed to outperform traditional broker’s price opinion and provide accurate measurements of a distressed property’s true-market value. Anne Anastasi Genesis Abstract Inc.
John Hollenbeck First American Title Insurance Co.
Robert Burgess Chicago Title Insurance Co.
Peter Birnbaum Attorneys' Title Guaranty Fund, Inc.
Mike Conway First American Title Insurance Co.
James Sibley Title Data, Inc.
Thomas Hartman First American Title Insurance Co.
Get a quick update on all of the meetings ALTA has planned and tailored to meet the needs of your operation. From our annual convention to meetings for large and small agents, we’ve got you covered. The National Notary Association said the four-year effort creates an updated roadmap for improving notary statutes in the wake of court rulings, and liability and compliance concerns. The Florida Title Insurance Study Advisory Council recently released a report and has recommended several changes to the title insurance industry in the state, including an overhaul of the regulatory structure and the development of a data call to collect financial information from licensed agencies and underwriters. Read on for more about the report, which describes title insurance as a needed product during market downturns to ensure consumers’ investments are protected. A recent request by the New Mexico attorney general to decrease title insurance rates in the state highlights a lack of understanding of the title insurance industry and the preventive measures title agents take to eliminate claims and protect consumers. The surge in profits stemmed from the company’s ability to cut costs and a substantial spike in business, as volume of orders closed soared 63 percent during the fourth quarter of 2009. The ability to close transactions and record documents electronically continues to make strides as Ingeo Systems recently signed a contract with Fifth Third Bank to submit mortgage documents electronically, while eLynx reported that its eClosingNet service has gained industry acceptance quicker than anticipated. Fourth quarter 2009 commercial and multifamily mortgage loan originations were 12 percent higher than during the same period last year and 15 percent higher than during the third quarter of 2009, according to the MBA. The owner of Maryland Title and Escrow allegedly induced individuals to invest money into a purported FDIC-insured money market fund that he “guaranteed” would pay monthly interest payments of 10.85 percent. Harry Gardner was named chair of MISMO’s governance committee and Stephanie Berger joined the committee, while Charles Epperson was re-elected as chair of the MISMO title workgroup and as a member of MISMO’s council of chairs. With headline after headline of negative news, it can be daunting to remain optimistic that things will get better for business in 2010. While it can be difficult to motivate yourself, energizing your staff is another story all together. Despite the market conditions, Darryl Turner believes title agents are closer to success than they think. Listen to Turner offer some powerful guidance on how to grow your title agency’s footprint, retain existing clients and bring in new business. The majority of the updates pertain to the GFE, but HUD also provided additional feedback on tolerance violations, the HUD and the written list of providers. The state’s attorney general has asked the insurance superintendent to decrease rates by 13.8 percent. This would exceed a rate increase that was approved last summer. Robert Reeder, who has 33 years of industry experience, has joined Stewart National Title Services as vice president, national business development. According to a report, the number of mortgage fraud cases increased last year, although the dollar amount held steady as federal authorities stepped up campaigns against the crime. LenderLive Settlement Services said it has increased its title production staff to accommodate the substantial demand for pre-foreclosure and loss mitigation title endorsements and recording services. A U.S. district judge failed to dismiss three class action Racketeer Influenced and Corrupt Organizations Act lawsuits accusing title insurance companies of allegedly overcharging consumers for title insurance on purchase and refinance transactions. The office released an opinion that says while not expressly prohibited by statute, Maryland counties do not have the authority to include debt forgiven by the seller’s lender when calculating the transfer tax. Former owners of a now defunct New York title agency that stole more than $1 million in client funds will spend up to five years in prison. Old Republic International’s title insurance business reported a profit for the first time since 2006, according to the company’s year-end and fourth quarter earnings release. Janet Minke will help Alliant National Title provide training, education and underwriting expertise to its title agents. While the number of homes entering the foreclosure process declined during the fourth quarter, it’s unclear how much of the drop in mortgage defaults is due to shifting market conditions or the result of changing foreclosure policies among lenders and loan servicers. While the collection and reporting of agent data will be an enormous change for the title insurance, if done correctly, it is an opportunity to silence critics and prove the industry’s value proposition. The industry is nearly a month into the new RESPA regulations that requires the use of the new GFE/HUD-1 forms, and the American Land Title Association would like to hear from its members on how things are going. A ruling last week by the U.S. Supreme Court removing restrictions on campaign contributions from corporations should have little or no effect on political action campaigns. TitleVest claims its new free service helps lenders comply with new stringent disclosure requirements imposed by recent revisions to the Truth in Lending Act. Barbara Mendoza, with 34 years of industry experience, has been named director of operations for Majesty Title Services. How Does Your County Calculate Transfer Fees on Short Sales? A Maryland County is calculating the transfer fee based on the sales price and amount of forgiven debt. This can cause deals to fall apart and could create violations to the new zero tolerance policy related to the new GFE/HUD-1 forms. ALTA would like to know how counties that you operate in handle this calculation. Read on to find out how several title companies have dedicated time and resources to help those in need in their communities. The American Land Title Association announced final publication of forms that were approved by the Board of Governors on Oct. 22, 2009. The Mortgage Industry Standards Maintenance Organization develops XML data standards for the lending, secondary, property, appraisal, recording and land title industries. Title agencies that have implemented new technology are finding the upgrade from obsolete systems can be a boon during the turbulent market. Freddie Mac reported the 30-year fixed-rate mortgage (FRM) averaged 4.99 for the week ending Jan. 21, down from 5.06 percent a week earlier. One county in Maryland is basing transfer taxes on short sales by calculating the sales and the amount of forgiven debt, while another county is reviewing the issue. Former Ultimate Fighting champion Chuck Lidell has joined a list of several investors alleging they were scammed out of millions of dollars by a shuttered California-based title agency. The company said the web-based version of eSecureFile reduces the gap risk by increasing the speed and efficiency of electronically recording closing documents. Five years after Hurricane Katrina brought to light a $777,000 defalcation, the title agent responsible for the crime has been sentenced to nearly three years in prison. Year-end figures show that Ingeo’s Electronic Document Recording System covers 38 percent of the total U.S. population. With certain exceptions, the FHA currently prohibits insuring a mortgage on a home owned by the seller for less than 90 days. This temporary waiver will give FHA borrowers access to a broader array of recently foreclosed properties. While many economists predict 2010 will prove to be the beginning of an economic recovery, the majority of title insurance professionals are less optimistic. Read on. The title agency was accused of maintaining a sham employment arrangement and paying a percentage of the company’s title insurance premiums in exchange for referrals. An Ohio bill that changes the transfer on death designation instrument from a deed to an affidavit was signed into law by Gov. Ted Strickland last month. VA offers two options for disclosing the fees on the GFE. One option is for lenders to itemize the charges in the empty 800 lines of the HUD-1 Settlement Statement, to the left of the column. Read on to learn how third-party fees, including title insurance and attorneys' fees are handled. According to the Mortgage Bankers Association, multifamily mortgage origination during the third quarter of 2009 was 54 percent below the same period in 2008, while new construction in October was at its lowest level ever recorded. A new initiative focused on mortgage companies with significant claims rates against the Federal Housing Administration mortgage insurance program was launched this week as 15 subpoenas were served to the corporate offices of 15 mortgage companies demanding documents and data related to failed loans that resulted in claims paid out by the FHA mortgage insurance fund. Old Republic will hold a conference call at 3 p.m. ET on Jan. 28 to discuss fourth-quarter and full-year results. From Blake Hanby, president of WACO Title Co., calling the plan a stroke of genius, to Rob Ptomely, manager of Colorado Land Title Company, saying you can’t buy groceries with gratitude, the American Land Title Association has received overwhelming support from underwriters, title agents and non-members since announcing in August its plan to license the use of its title insurance policy forms. Read on for more reaction. Title Data said it has completed a multi-million-dollar project that will change the way land title evidence plants are built and maintained. Read on to find out how the new system abstracts information from publicly recorded documents. Lenders, asset managers and capital markets managers are in need of expert lien resolution to clean the title baggage that accompanies most defaulted loans. The Short Sale Commander update allows users to assign guess access to others so they can receive real-time updates without calling or e-mailing for the status of the short sale. Fannie Mae is undertaking a review of hundreds of condominium projects in Florida in an effort to allow additional projects to become Fannie Mae-eligible through a new "Special Approval" designation. The Colorado Department of Regulatory Agencies released its 2009 report on the title insurance industry. Read on to find out what it concluded about market trends and the types of enforcement actions and consumer complaints the department dealt with last year. The companies have been folded into First American Title Insurance Co. According to the technology vendor, the SoftPro 360 service streamlines the ordering of closing, title and escrow services for a faster, easier and more affordable process than traditional ordering. The company will release results at the close of regular market trading on Feb. 3 and hold a conference call on Feb. 4. Check out who helped ALTA's Political Action Committee reach its goal of raising more than $250,000 in contributions last year. American Land Title Association President Mark Winter describes 2010 as a critical time and says the challenges facing the land titling industry are profound. Read on for his vision for the association and the industry, and why he feels it’s important for title agents to not only manage their operations, but transform them, and provide information to an evolving real estate market. In 2009, the PAC raised nearly $252,000, and has garnered more than a half million in contributions over the past election cycle. The company said Steve McDonald, who spent 12 years as the recorder of deeds in Lancaster County, Pa., will help its team better understand the issues and challenges recorders and other government officials face with respect to privacy, statutes and the needs of their business constituents and citizens. Lenders can enter loan information and receive an instant quote on title insurance, settlement fees and applicable government fees, California-based Timios reported. The wife of a former president of the American Land Title Association recently passed away, while a former executive of the association lost a battle with cancer. Roslyn B. Payne, who is president of a real estate venture capital and investments firm, resigned from the board of directors effective Dec. 28, 2009.